Who would not bow down to butter, cream and cheese! Alfredo di Lelio, after whom this dish was named was a restauranteur in Rome in the early 1900's. Mary Pickford and Douglas Fairbanks, on honeymoon in Rome, dined on this dish every night at Alfredo's restaurant. Once you try this recipe, you will never buy pre-made Alfredo sauce again. This version is a little lighter, but still totally decadent and off the charts delicious and #Boursin makes it easy! 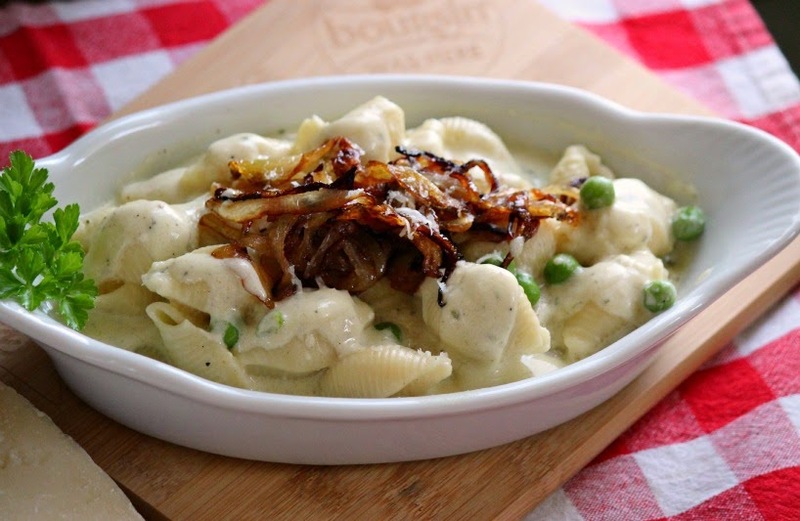 #Boursin Garlic & Fine Herbs has the perfect, mouthwatering recipe in a creamy blend of real cheese, savory herbs with just the right amount of garlic. You can use traditional fettucine or any pasta. I chose shells to trap all that delicious sauce! In a medium saucepan, melt better over medium-high heat. Add sliced onions and saute until golden brown, stirring frequently, about 10 minutes. Bring 4 quarts of lightly salted water to a boil and add macaroni. Cook until al dente, according to package directions. Drain. For more serving ideas to go www.boursincheese.com Follow Boursin on Facebook, Twitter and Pinterest I have received this product for free from Smiley360 in exchange for my honest review. You can joing Smiley360 at www.smiley360.com!